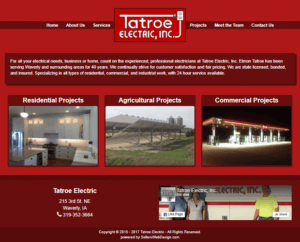 Tatroe Electric is an elecrical contractor company based out of Waverly, Iowa. Tatroe Elecric has been in the business for over 40 years and works on residential, commercial, and industrial projects. The Tatroe Electric website was built to be fully responsive to any device or browser it is viewed from. The website was designed according to the company’s specifications, and utilizes our content management system for easy modification of website content, slideshow image upload, and gallery image upload.